Nestled in the heart of Quincy, Massachusetts, is the appropriately named neighborhood of Quincy Center. Quincy Center has a long history and was the original locale of the first Quincy transportation routes leading from Boston to the rest of the South Shore. Eventually Quincy Center became the retail hub of Quincy and became home to Quincy College. Quincy College is a 2-year community college serving residents of Quincy and the surrounding area. Also in Quincy Center you’ll find the Thomas Crane Public Library, Quincy City Hall, the Quincy City Red Line and Old Colony Commuter Rail. Today Quincy Center is home to several mixed-use developments and because of all of its great amenities, is a great place to buy a home. Quincy Center covers the downtown area of Quincy, centered along Hancock Street. Quincy Center hosts numerous special events and festivals throughout the year. Some of the locals favorites include an annual sidewalk sale in July, a Thanksgiving Day Parade, a Christmas Parade and a Flag Day Parade. Buy a home in Quincy Center and not only will you find yourself entertained by community events, but you will also enjoy some very diverse and delicious dining options. Quincy is widely regarded as the dining capital of Boston’s South Shore and has a plethora of restaurants to choose from serving American, Asian, Indian, Irish, Italian, and Mexican cuisines. Some of the locals’ favorite restaurants include The Townshend, Donut N Donuts, Coffee Break Cafe, Craig’s Cafe on Hancock Street and Cucina Mia Cafe on Washington Street. Homes for sale in Quincy Center vary is size, architectural style and price, so no matter your budget or your tastes, Quincy Center has a home for sale that you’re sure to love. 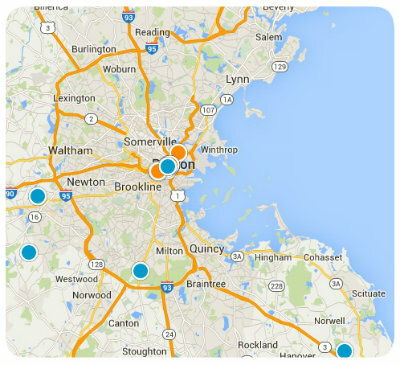 If you would like more information regarding homes for sale in Quincy Center, or you have other Quincy, Massachusetts real estate questions, please do not hesitate to contact us today.